QSine is keeping a campaign promise. Incidentally, there was a holiday special on Dec 24, if you missed it. 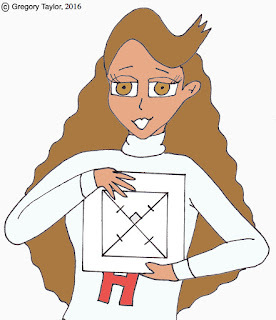 Or check out the “Do We Have a Square Here?” video directly. 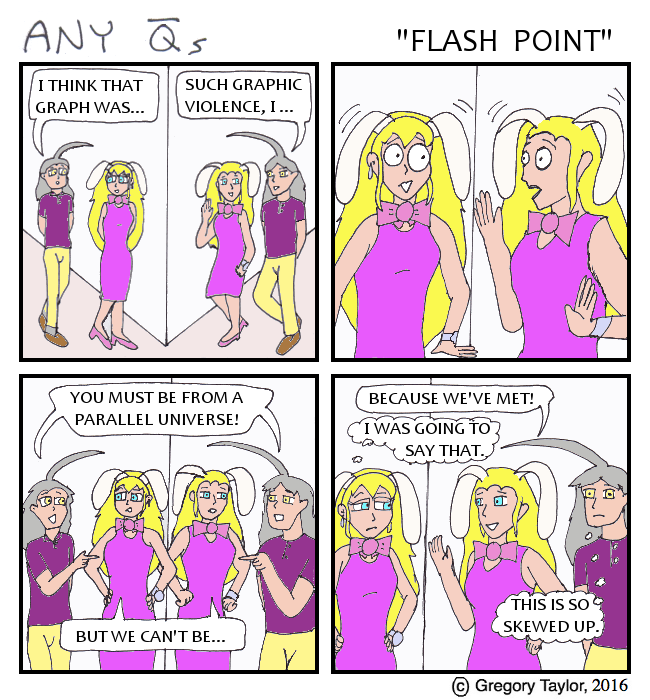 Funny enough, the comic (x, why?) used the same song for their 2016 Christmas Day parody. 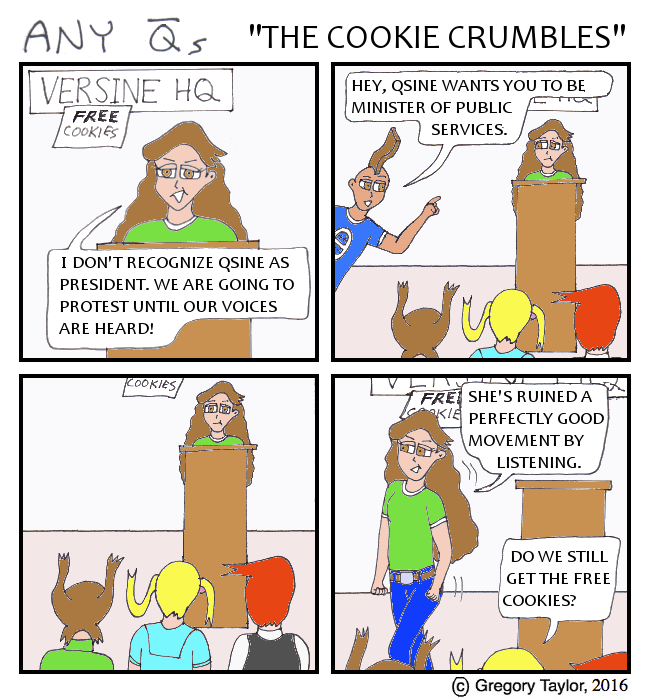 VERSINE: I don’t recognize QSine as president! We are going to protest until our voices are heard! QARCSIN: QSine wants you to be minister of Public Services. 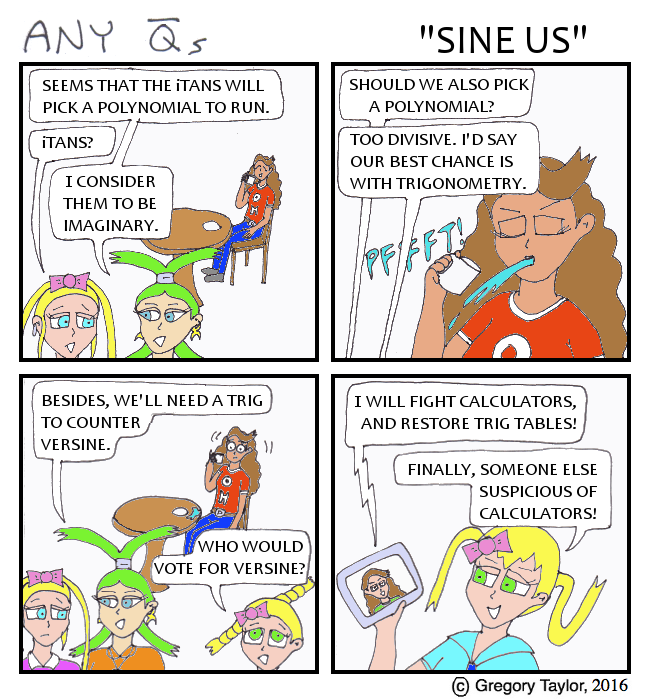 VERSINE: She’s ruined a perfectly good movement by listening. QQUINN: Do we still get the free cookies? 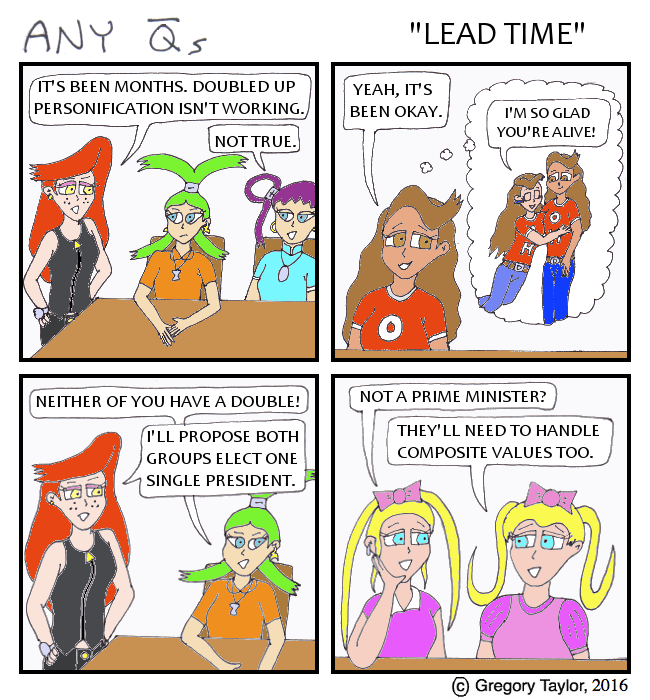 “Madam President,” chorused both QT and Hyper, coming to attention as QSine entered their lab. “Because we’d have to pull things together in under a week?” Hyper remarked. “I hope you know what you’re doing,” ParaB said. “Why do we have to cut these things so damn close?” Hyper sighed. QSine simply smiled. As she was the new personification president, it would be no trouble getting the other functions to participate. LYRICS LINK TO "DO WE HAVE A SQUARE HERE"
Yes, cabinet positions go to others who ran (or in ArcTan's case, for the write-in). Can anyone pinpoint good reasons for the choices? There was the "Bunny Ears Lawyer" gag from years ago. QARCSIN: You still made Gamma foreign affairs minister? 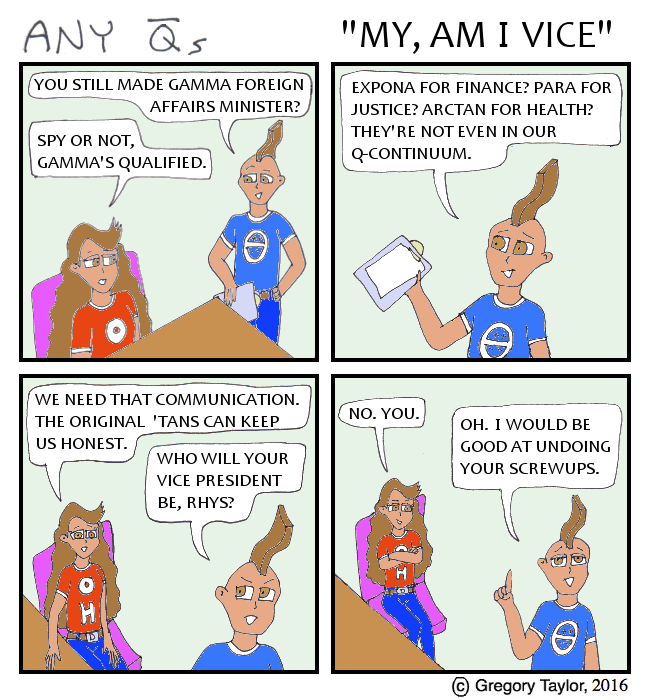 QSINE: Spy or not, Gamma’s qualified. QARCSIN: Expona for finance? Para for justice? Arctan for health? They’re not even in our Q-Continuum. QSINE: We need that communication. The original ‘tans can keep us honest. 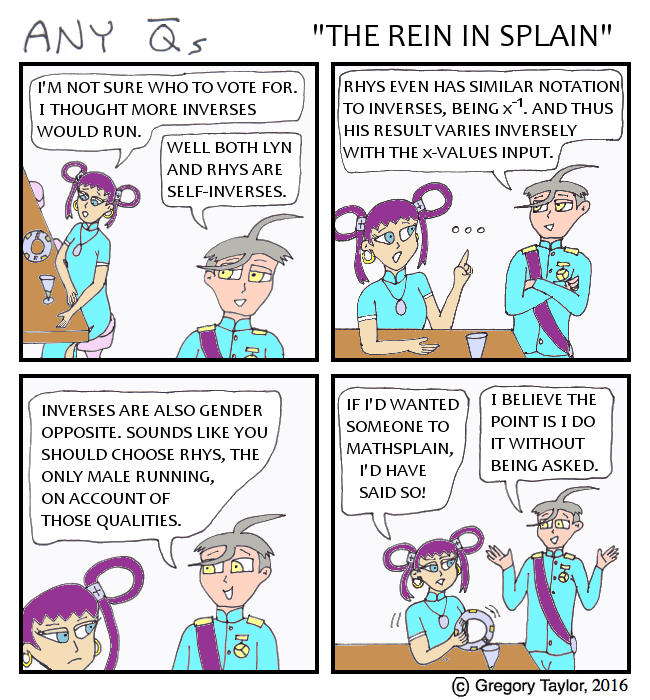 QARCSIN: Who will your Vice President be, Rhys?! QARCSIN: Oh. I would be good at undoing your screwups. I finished my NaNoWriMo yesterday, which resurrects Sine from “Sine Off” (Entry 177), in LGBTQ style. Coincidentally, as Sine’s counterpart here becomes President. Let me know if you have thoughts, or want to beta. Connected to the mouse rollover, Conspicuous Trenchcoat is a TV Tropes thing. QSINE: According to records, Maud once spied on Taylor’s Polynomials. Then he spied on us. QSINE: Gamma, I think you’re in a similar position. You’re observing here, on behalf of the more advanced relations. GAMMA: True. Do you want me to be minister of foreign affairs? QSINE: I want you to expose yourself. GAMMA: Some can’t even deal with me being out of my closet. There was apparently a record turnout in Austria for their vote yesterday. In my poll, I think Sine won by 2 votes. 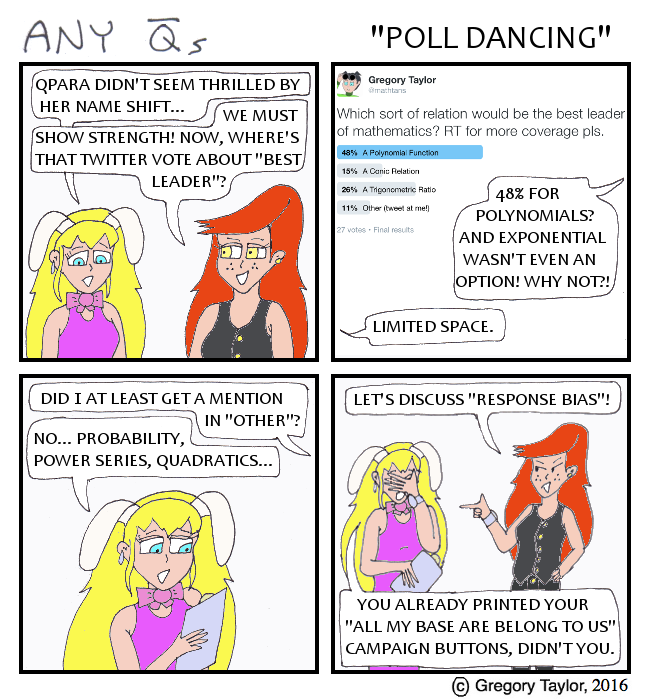 As to my "initial poll" referenced here, that was back in May with "Poll Dancing". QSINE: Wait. I won? 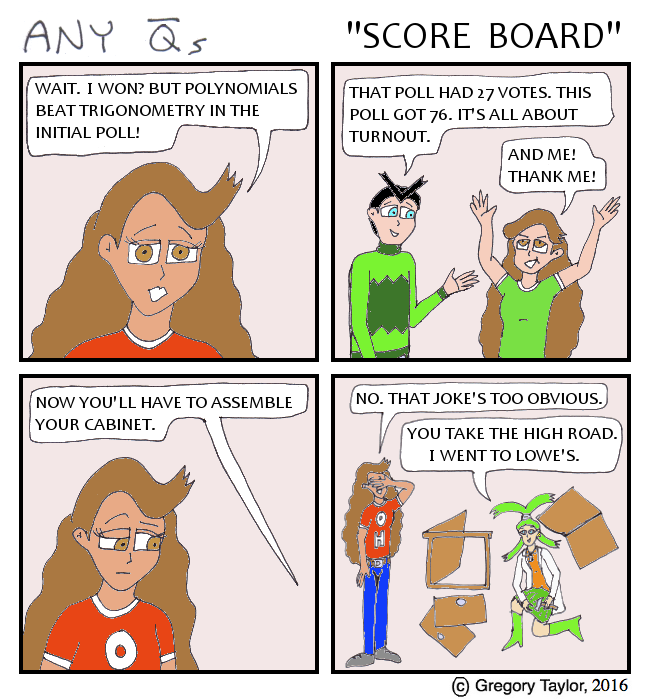 But polynomials beat trigonometry in the initial poll! MAUD: That poll had 27 votes. This poll got 76. It’s all about turnout. VERSINE: And me! Thank me! QHYPER: Now you’ll have to assemble your cabinet. QSINE: No. That joke’s too obvious. QHYPER: (with cabinet materials) You take the high road. I went to Lowe’s. I have spent the last several months working on edits to Time & Tied Book 4. That’s now done, and my NaNoWriMo plan involves personified math - so time for another run here? Yes? No? QEXPONA: I’m a zombie. That's scary because of exponential growth. QELLY: I’m a ghost. That's scary because they may be out of focus. QSINE: I’m a vampire. That's scary because they transcend dental work. Yes, the Exponas are slightly different. And that’s entry 275. 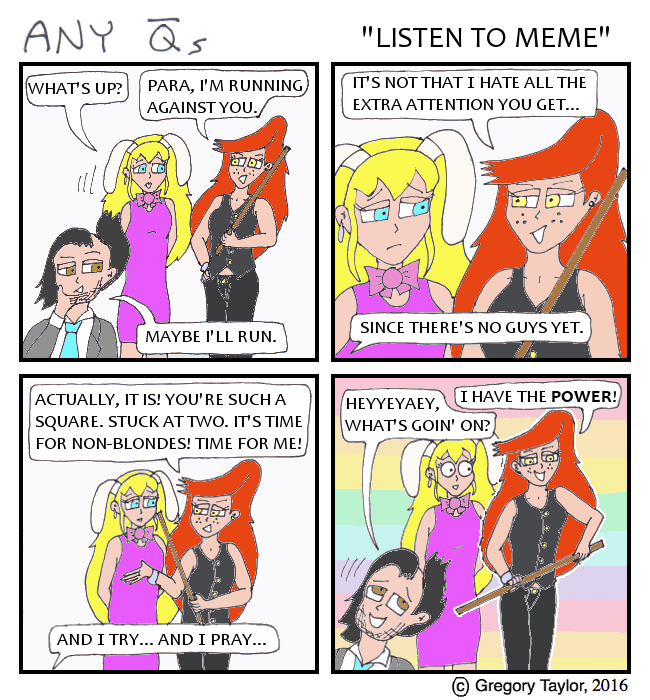 Comic #53. 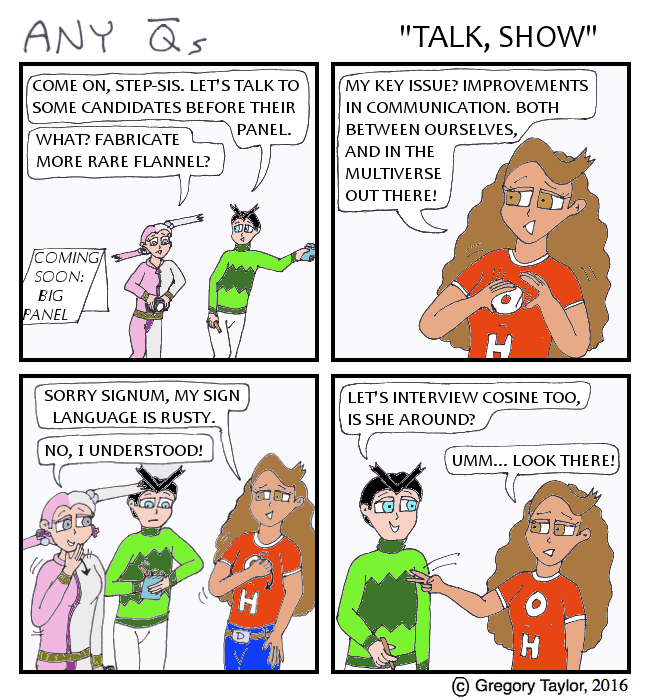 #54 if you count Strip 0, #55 if you count Tangent Pants. Every Monday without fail for a year while full time teaching. And there’s been no activity on the blog for the last third of that (since March with WODB), my FB posts reaching about 10 people. I’m going crazy talking to myself. So I’m going to put more effort into parody videos and my time travel serial. From this point on, updates will be sporadic. Thanks for reading! 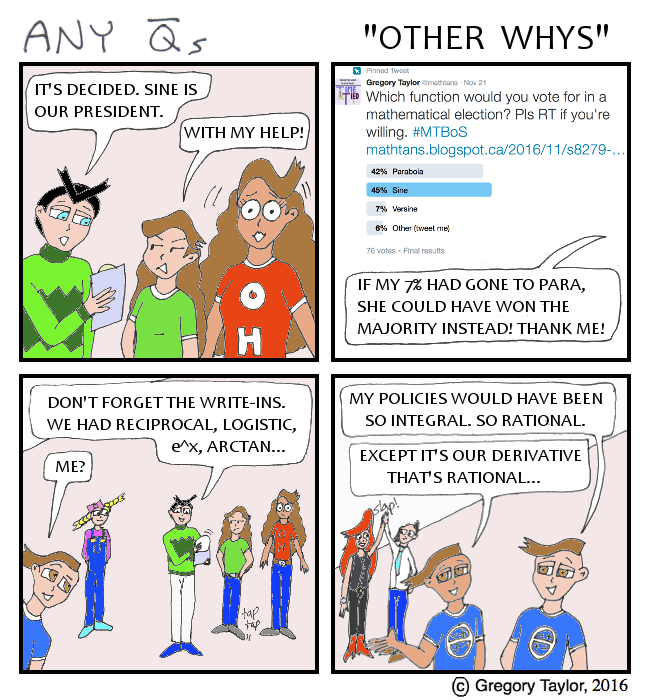 QEXPONA: Why are you running against Para? You’re splitting your own votes. EXPONA: I’m tired of parabolas getting all the attention! Aren’t you? QEXPONA: Those with the most visibility also get the most hate. That can’t be easy. I befriended my Para for mutual support. 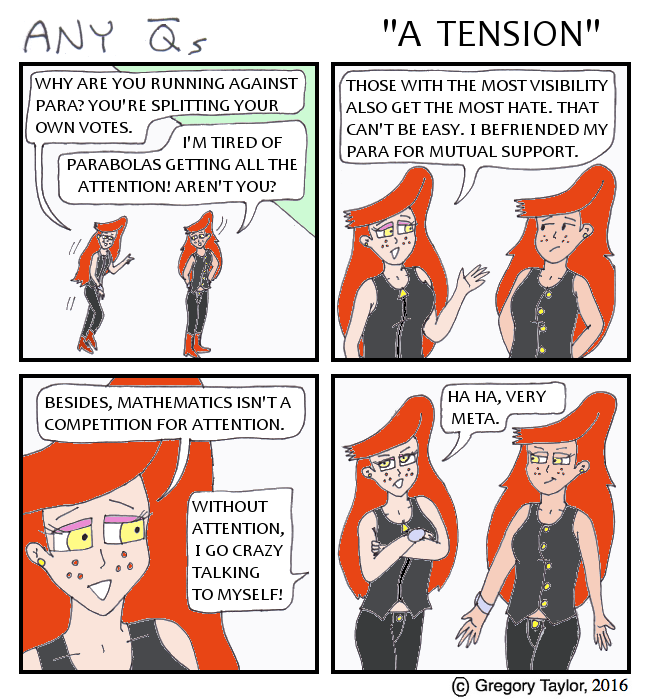 QEXPONA: Besides, mathematics isn’t a competition for attention. EXPONA: Without attention, I go crazy talking to myself! QEXPONA: Ha ha, very meta. I was recently reminded of Math Misery’s post about “Annoying Function Notation”, which itself reminded me of something I saw on Twitter some time ago. I’m sure I’m guilty of trying to explain things when it’s totally uncalled for. Like the jokes. QELLY: I’m not sure who to vote for. 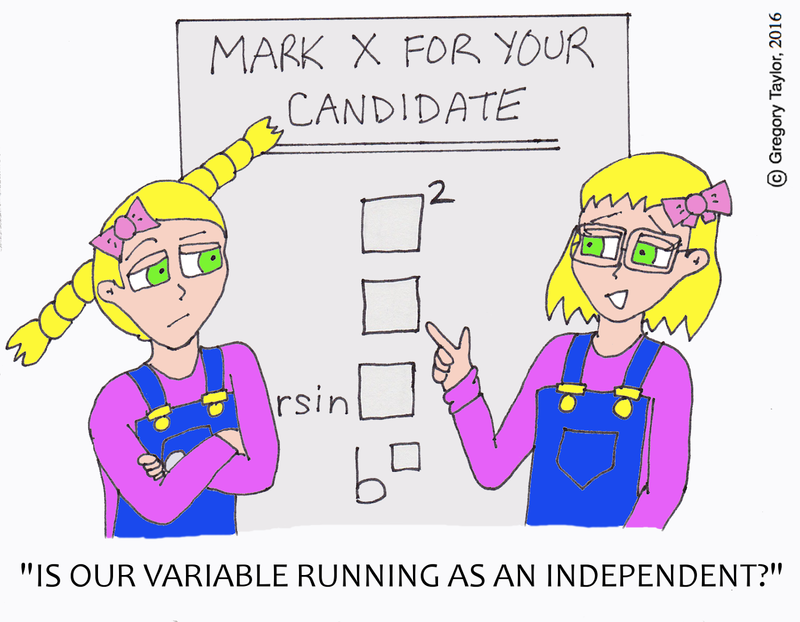 I thought more inverses would run. RADIK: Well both Lyn and Rhys are self-inverses. RADIK: Rhys even has similar notation to inverses, being x^-1. And thus his result varies inversely with the x-values input. RADIK: Inverses are also gender opposite. Sounds like you should choose Rhys, the only male running, on account of those qualities. QELLY: If I’d wanted you to mathsplain, I’d have said so! RADIK: I believe the point is I do it without being asked. Today's comic features guest art by John Golden (@mathhombre)! He's been looking at Math and Art recently, so see that page for many resources. We put this together during a rare in-person encounter at "Twitter Math Camp" a week ago. 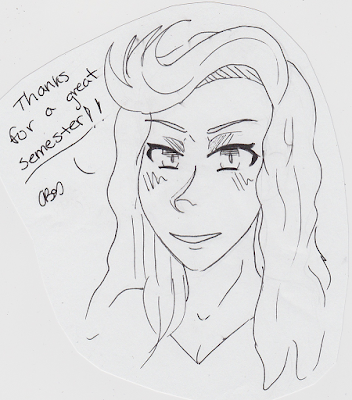 I'm to blame for the inking. Check the mouse rollover to see about the writing. ROOT & ROOT2: You must be from a parallel universe! PARA (thinks): I was going to say that. ROOT2 (thinks): This is so skewed up. ?? 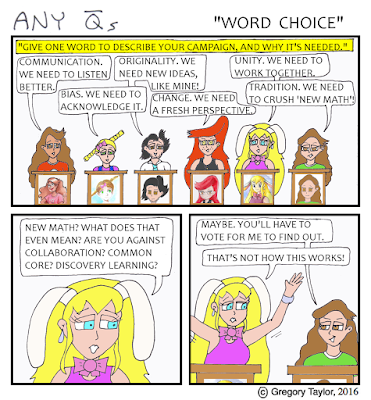 : Give one word to describe your campaign, and why it's needed. QSINE: Communication. We need to listen better. QLYN: Bias. We need to acknowledge it. RHYS: Originality. We need new ideas, like mine! EXPONA: Change. We need a fresh perspective. PARA: Unity. We need to work together. VERSINE: Tradition. We need to crush 'new math'! PARA: New math? What does that even mean? 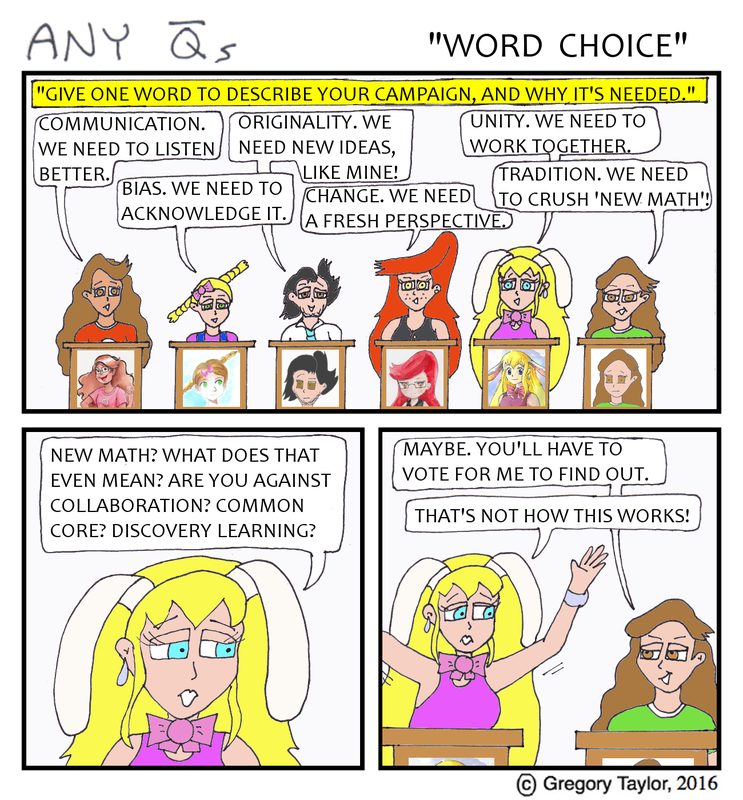 Are you against collaboration? Common core? Discovery learning? VERSINE: Maybe. You'll have to vote for me to find out. PARA: That's not how this works! The last panel is a call back to Entry #245. Signum's issue was first discussed in Entry #113. 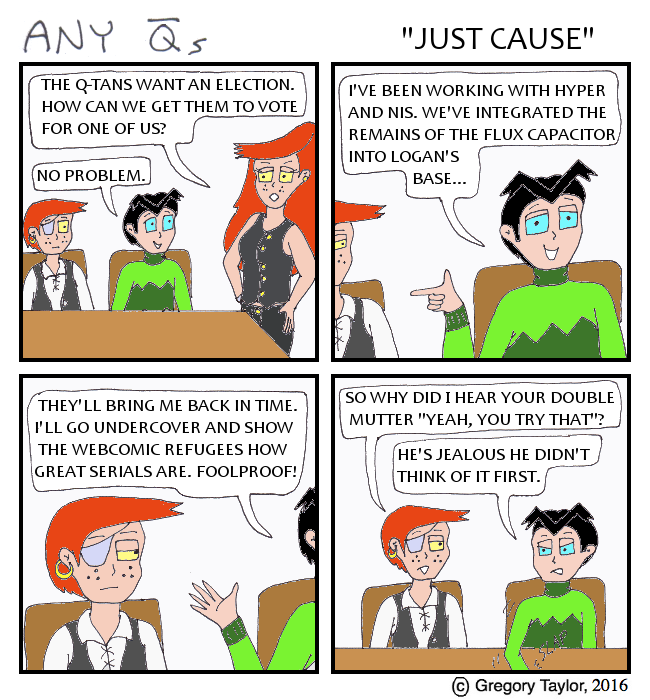 Speaking of the multiverse, check out the Solution Squad comic! 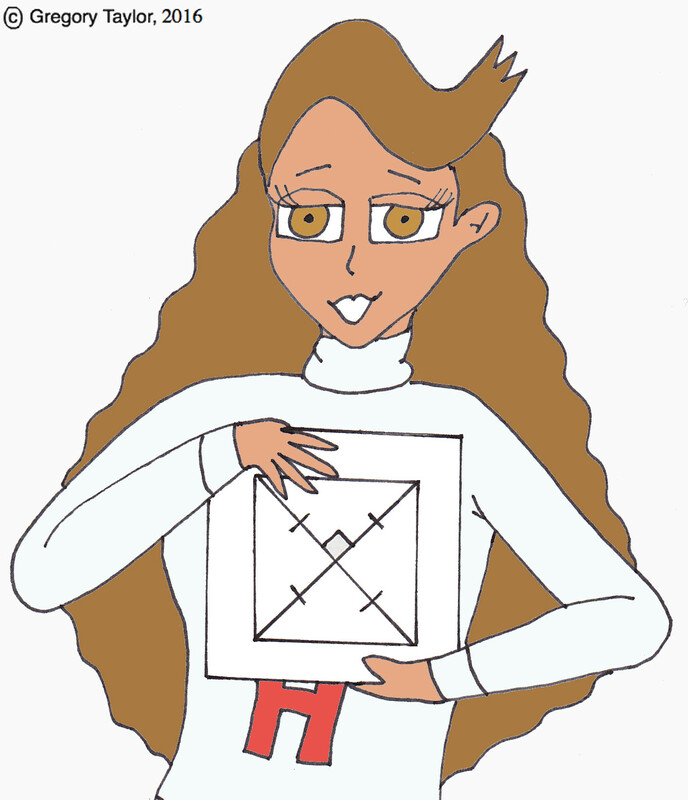 Math superheroes, more professionally drawn! MAUD: Come on, step-sis. Let’s talk to some candidates before their panel. SIGNUM: What? Fabricate more rare flannel? MAUD: Let’s interview Cosine too, is she around? Earlier this week, there was an article about how the standard measure of the kilogram may be changing. 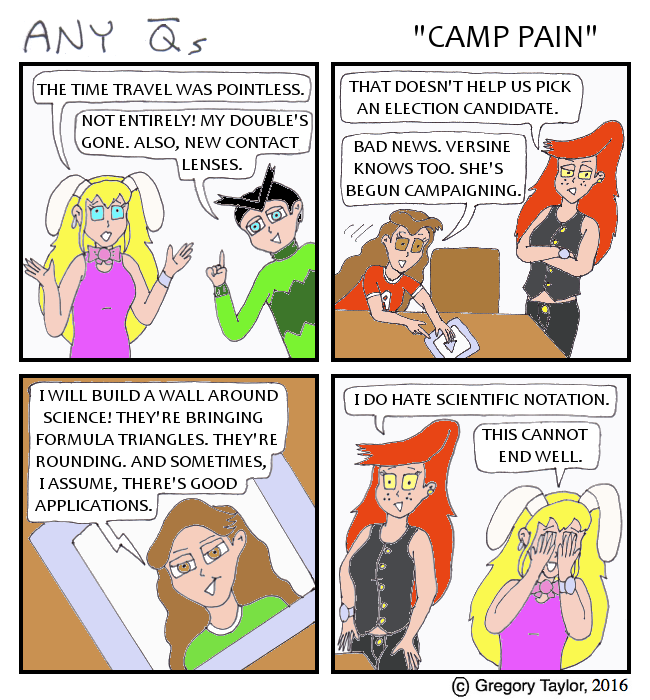 Related to this music video by the Doubleclicks. And I needed a punch line. Hope it works. 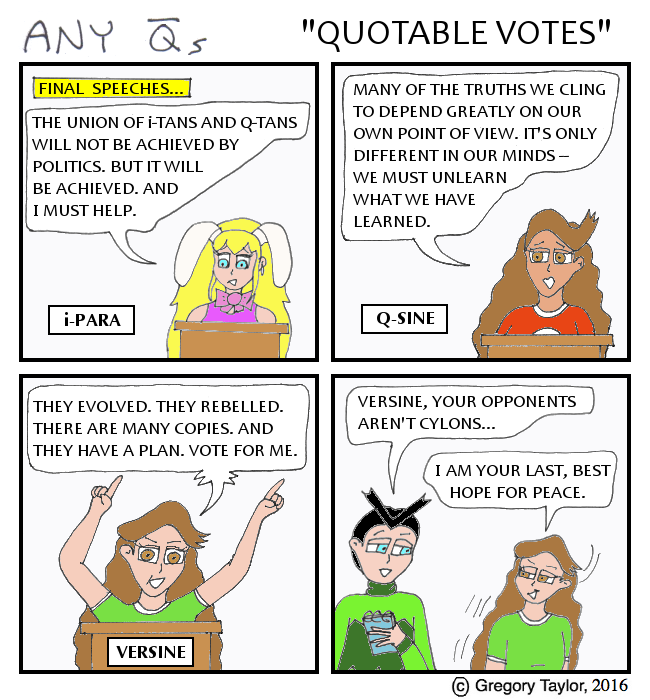 QQUINN: What's a vote for Versine do? CANTOR: I worry about these high school functions sometimes. GAMMA: Some lessons must be learned the hard way. QLYN: Hey, Gamma? C-Can we talk about sexuality? GAMMA: Sure! See, CanTor? Some of them are asking good questions. GAMMA: Besides, we need to change too. Seen the news about our kilogram walking the Planck? Expona’s dialogue made me think of He-Man. And I had a student present on memes this past week. 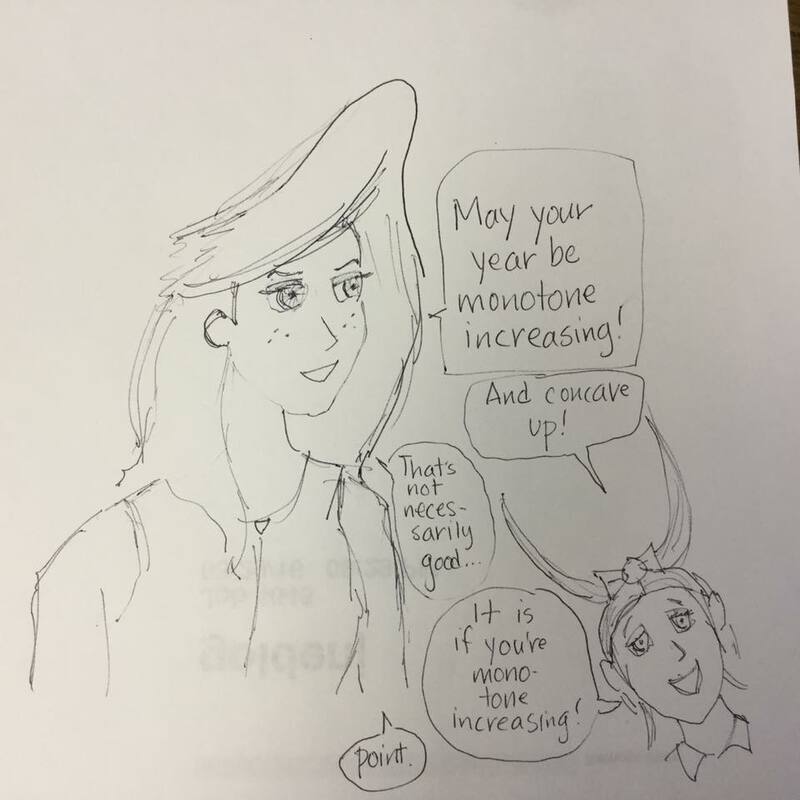 Of course, the He-Man meme is old, the song by "4 Non Blondes" is actually called “What’s Up?”, and I’m trying to get up this great big hill of hope for views while grading so many papers before exams so send help? EXPONA: Para, I’m running against you. RHYS: Since there’s no guys yet. EXPONA: Actually, it is! You’re such a square. Stuck at two. It’s time for non-blondes! Time for me! RHYS: Heyyeyaey, what’s going on? EXPONA: I have the POWER! I’m trying my best to be relevant, yet not offensive. Any feedback from the crickets? ... Okay then. QHYPER: Um. No offence, but I don’t think anyone will go for a gender neutral president. QLYN: What makes you say lines are gender neutral? QHYPER: I... thought you were born that way. What with being a self-inverse. QRADIK:Which bathroom do you use? QLYN: I’m not a piece of qualitative data to be categorized! Lyn’s standard form was first seen way back in #31: Standard Transmission. I was surprised lines didn’t do better. 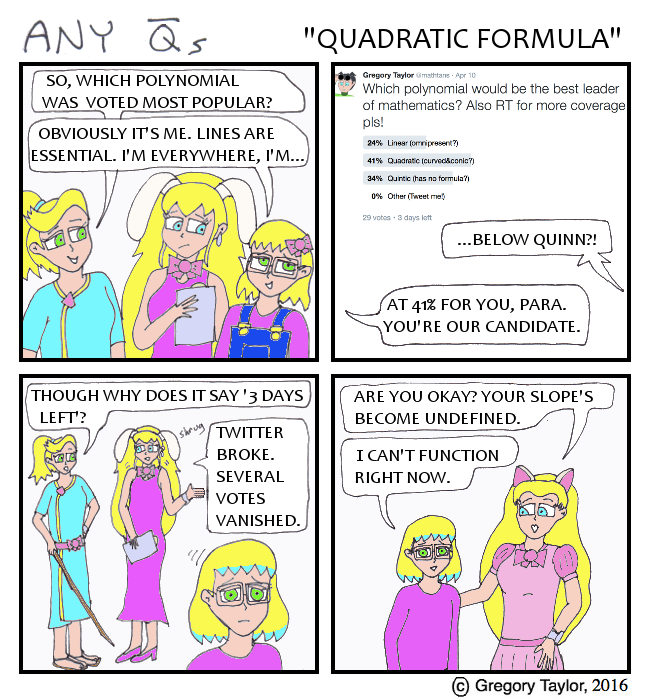 CUBI: So, which polynomial was voted most popular? CUBI: At 41% for you, Para. You’re our candidate. CUBI: Though why does it say ‘3 days left’? PARA: (shrugs) Twitter broke. Several votes vanished. QT: Are you okay? Your slope’s become undefined. LYN: I can’t function right now. Random Self-Indulgence. No plans to index it. You can do whatever you want at age 40, right? Enjoy. QT: The author's age hit degree four. So I surprised him by jumping into a cake. PARA: B-But don't humans jump OUT of cakes? QT: Oh. That would explain his surprise. April is insane. The comics I've posted this month were all drawn at the end of March, during Easter. 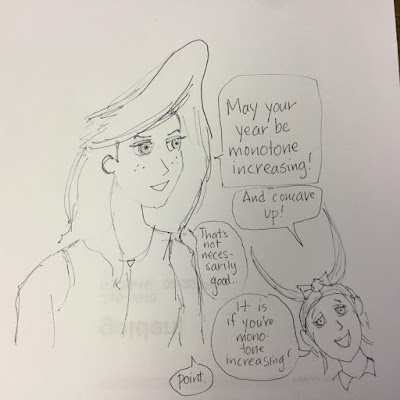 Even now, after report cards and the school play, I still need some time to figure out where this math comic is going... hence, another Art Aside. 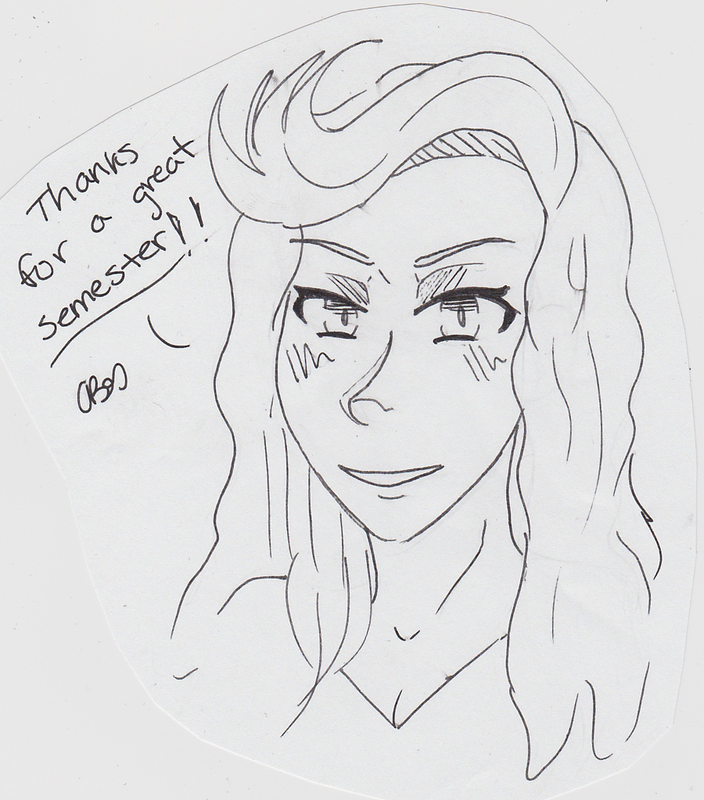 The one I promised in my resumption post, back in July 2015, after ConBravo. 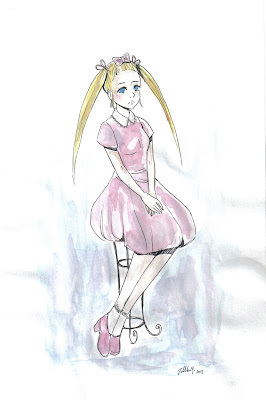 You can see the first Art Aside for Para back in June 2013. 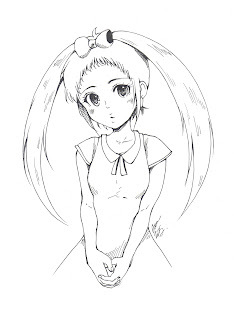 That's when she was from "Taylor's Polynomials" and had the bunny ears - now she's from "Any Q-bars" has the twintails. Both of the following were drawn by artists at ConBravo 2015. QPara, as I've tagged her in these posts, looks very sad there - but that is what I specified. Hair down means depression is maximized. Plus the first Para had a whole depression arc in Series 5, so it makes sense that new Para would have similar issues. I had pretty rough character sketches going into the relaunch; here's what another artist took from my same sketch a day later. 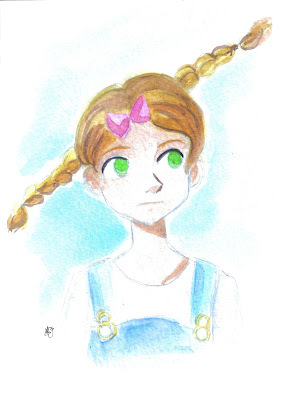 I really like this one too; interestingly, I see her mouth a bit differently depending on how I look at it. Shading versus lips. Only me? The plan is see more about that going forwards, though any additional comments you have can be left down below too. Thanks for reading! I hope you stick around! With this, Series 7 is over. Who will run? Who should win? If you have thoughts about Series 8, let me know. In the meantime, check out Joseph Nebus who is running Mathematics A to Z, and makes a pretty good case for (P)olynomials. PARA? : The time travel was pointless. MAUD: Not entirely! My double's gone. Also, new contact lenses. EXPONA? : That doesn't help us pick an election candidate. COSINE? : Bad news. Versine knows too. She's begun campaigning. 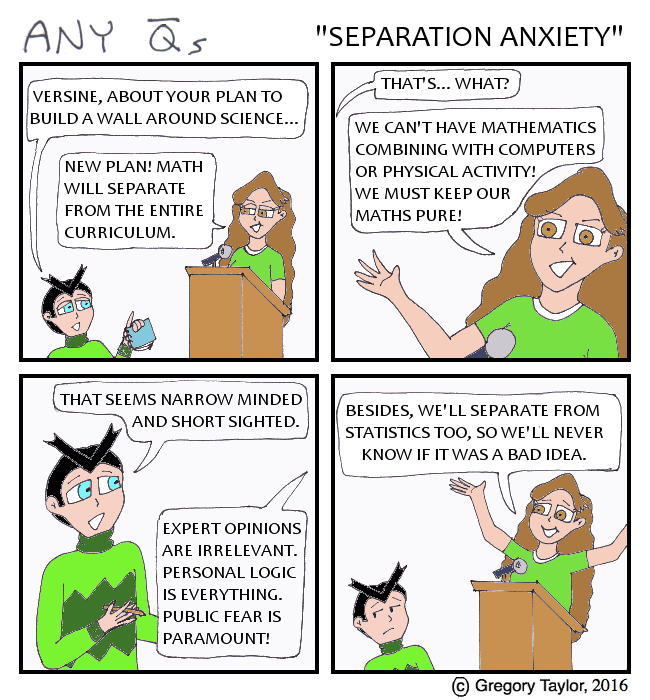 VERSINE (video): I will build a wall around science! They're bringing formula triangles. They're rounding. And sometimes, I assume, there's good applications. EXPONA? : I do hate scientific notation. PARA? : This cannot end well. New Twitter vote! Please check it out and share. I said back in March 2013 that there would be a time travel arc. EXPONA? 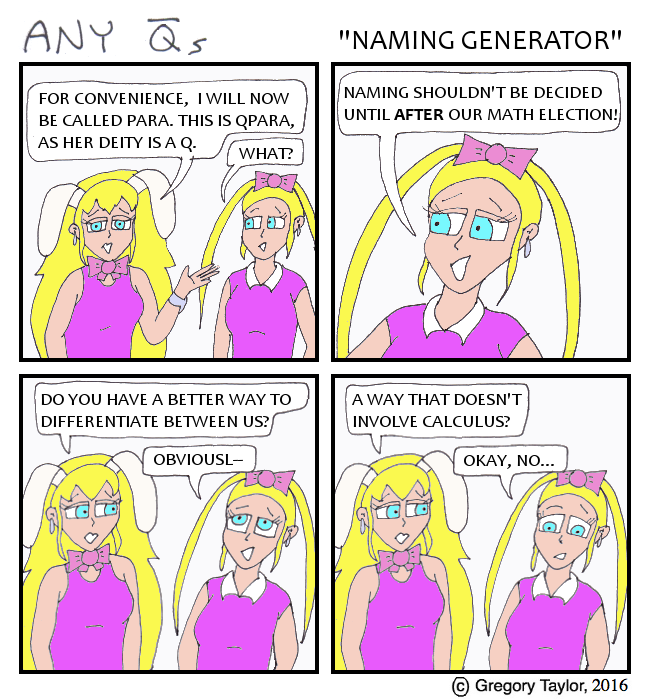 : The Q-tans want an election. How can we get them to vote for one of us? MAUD: They'll bring me back in time. I'll go undercover and show the webcomic refugees how great serials are. Foolproof! LOGAN? : So why did I hear your double mutter, "Yeah, you try that"? MAUD: He's jealous he didn't think of it first. Happy Square Root Day! Meanwhile, time skip. Please consider voting here on Twitter. EXPONA: It's been months. Doubled up personification isn't working. SINE: Yeah it's been okay. HYPER: Neither of you have a double! EXPONA: I'll propose both groups elect one single president. PARA: Not a prime minister? QT: They'll need to handle composite values too.